That day the sun beat down on the blue china shards, all day long, and the blade of grass, slightly wilted, was a blade of grass. 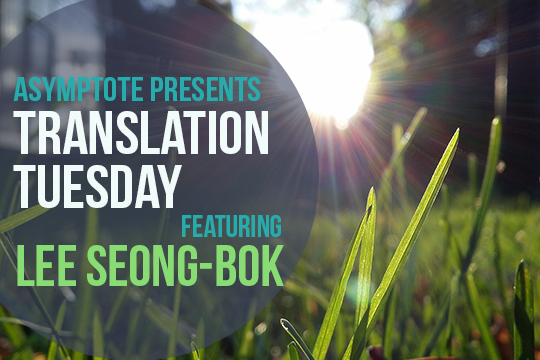 Courtesy of Literature Translation Institute of Korea, we are pleased to showcase the work of Lee Seong-Bok, translated by Yea Jung Park. Wistful for lost opportunity, these urgent, insistent prose poems hark back to a time of youth, and are sure to evoke strong personal memories. of going there and living, just the two of us! That year in late spring, one night spent in the bungalow by the reservoir. Tens of thousands of stars whizzing above the campfire. The night-long cuckoo cry engraved a tattoo on my forearm in the shadow-shape of a heaving wooden ship, and sister, in the morning all those day-lily blossoms, I did not know where to find your eyes among them. Eyes with yellow petals hung like the wings of a fan, eyes rolling like iron hoops to the sound of buzzing. Even now, at the cuckoo’s cry my crazed arms will mimic the rowing of a boat, and sister, the boat we rode on that day advances carefully through the buzzing day-lily stars, searching for the eyes you have lost in the night. I wait all night for the guest whom I love. As a child, hanging a blade of grass between two shards of china, what had I been waiting for? For it to become a bowl of rice, some nice side dish, a bride and groom? All day long the sun beat down on the blue china shards, and the blade of grass, slightly wilted, was a blade of grass. Who made him be a blade of grass between two shards of china, the blade of grass that does not become anything even after the children’s playing house is over, the blade of grass no one looks back on when the play is over, who made him be a wilted blade of grass between two shards of china? That day the sun beat down on the blue china shards, all day long, and the blade of grass, slightly wilted, was a blade of grass. Lee Seong-Bok’s trademark multi-layered poetry melds modern Korean poetics with Western influences to comment on the twists and perversions of the modern world. Lee focuses on relations and defies binaries, but also considers the tension between opposing categories to be a source of strength. In On the forehead of the moon are wave-patterned marks (2003), Lee brings an often implicit intercultural conversation directly onto the page, choosing a few lines of translated poetry from various languages as epigraphs for each of the 100 prose poems in the collection. The juxtaposition creates a tight-knit relationship between borrowed and invented text, but this relationship is a warped, localized, and even perverted one, evoking the (dis)continuity of world literatures in contact. Yea Jung Park is a Seoul-born translator and literary scholar, currently living in New York and pursuing a PhD in medieval English literature at Columbia University.